Manchester United were on a decent run of form before their defeat to Manchester City prior to the recent international break. 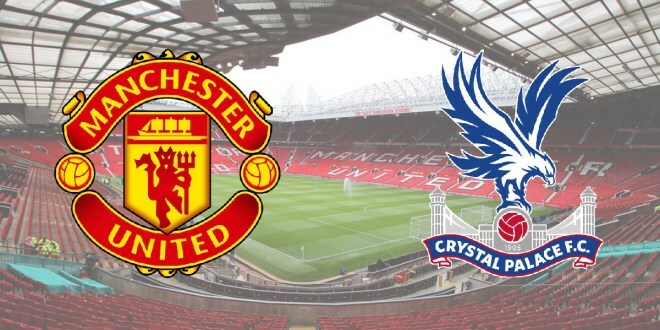 Jose Mourinho’s men will look to take three points off struggling Crystal Palace, but they may have to play the game without a number of their first team, many of whom are doubts for the game. Luke Shaw will be absent as he has accumulated five yellow cards and will serve a one-game ban. Romelu Lukaku and Marcus Rashford are doubtful for the game, however in better news it’s thought that Paul Pogba should return for the game. Chris Smalling and Victor Lindelof may start at the heart of the defence with David De Gea between the sticks. Shaw’s absence could see Ashley Young deployed to the left back role as out-of-favour Valencia could resume his right-back role in the team. Pogba’s return will reinforce United’s presence in the middle of the park. The Frenchman will be asked to play the more attacking role while Nemanja Matic and Ander Herrera are likely to sit back and guard the defence. If Lukaku does not return, Alexis Sanchez will likely lead the Red Devils forward line. The Chilean has been less than impressive in recent weeks despite his winning goal against Newcastle United and badly needs to find some consistent form for his team. Anthony Martial is in form and he will start on the left, while Jesse Lingard had a successful time away with England and his confidence will still be high after the heroics of the Three Lions, Mourinho will no doubt try to capitalise on that and start the 25-year-old on the right. 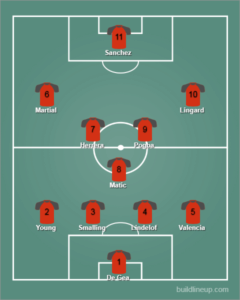 Line-up: Dea Gea, Smalling, Lindelof, Young, Valencia, Pogba, Matic, Herrera, Sanchez, Martial, Lingard.